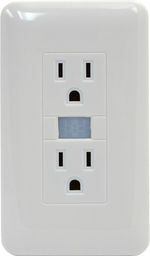 The Lawmate Hidden Camera Outlet contains a complete covert video system built into an electrical power outlet. It may be our most innocuous gadget yet. Using the included Stick-It! tape you will be able to set up and place covert video on walls anywhere in 30 seconds or less! This is innovative stationary covert video at it's best. Great for any room in a house, office, hotel, meeting room, garage, workshop, or retail store. The high-grade, covert video camera features a built-in DVR and motion sensor. The motion activation and time and date features make covert video operations simple for all users. Your covert video Stick-It! records to a MicroSD card hidden inside the unit. Cover plates are easily and quickly removed for access to the MicroSD slot. Simply review the footage from the card each day of use and replace the card to continue your covert video operations. Small, compact, and portable. This camera will fit in your shirt or coat pocket. The Lawmate Hidden Camera Outlet renders expensive and bulky covert video systems obsolete for your short-term, covert surveillance or nanny camera needs. Please Note: The Demo Video Below is in 720P But Our Lawmate Outlet Spy Camera and DVR is NOW IN Hi-Definition 1080P Resolution! From 5 feet you will get knees but 10 feet and out you will get the full body shot.